The Autoexposure (AE) Lock on your dSLR lets you meter and focus on one area of the scene, lock the autoexposure reading into the camera, recompose the shot, and then take the photo with the original exposure settings. Sounds fun! You’re photographing backlit subjects. You can meter using a spot or center-weighted metering mode, and then compose the picture the way you want it (not what was necessary to meter it). You want to take several shots with the same exposure settings. 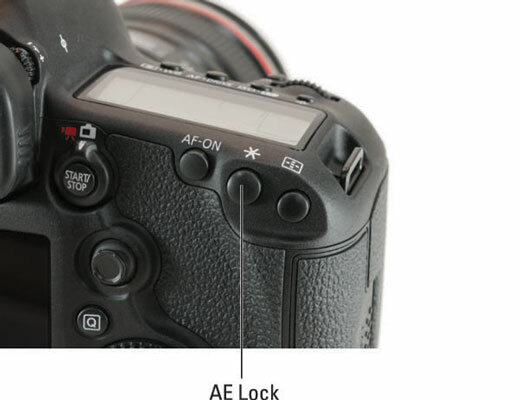 AE Lock keeps the camera from metering between each shot and possibly changing the exposure settings. This is necessary if you’re in an autoexposure shooting mode; in this case, the metering mode is less relevant. 1If you plan on recomposing the shot, select spot or center-weighted metering. AE lock is very effective when you’re photographing backlit subjects. You can force the camera to very selectively meter the scene. That’s why you need to switch to a spot or center-weighted metering mode. 2Center the subject (center-weighted metering) or place it under the selected autofocus point (spot metering). Read your camera’s manual for how to change metering modes and select and use autofocus points. Changing metering modes (and whether you’re using manual or automatic autofocus point selection) may change which autofocus points are used. 3Press the shutter button halfway down and hold it to meter and autofocus. When it’s focused, you can let go of the shutter-release button, because the AE lock button also locks the focus. If you’re focusing manually, you can focus when you like. 4Press the AE lock button. You might feel like you have too much to do with too few fingers: Hold the camera with the help of your right palm and fingers, press the shutter button with your index finger, press the AE lock button with your thumb, possibly rotate a dial or two in between. If necessary, while holding down both the AE lock button, recompose the shot. Put the subject where you want it in the frame. To lock in the exposure for more shots, keep holding the AE lock button. You can also note the shutter speed and aperture, switch to Manual mode, and dial in those values yourself. Here is a photo using AE lock. 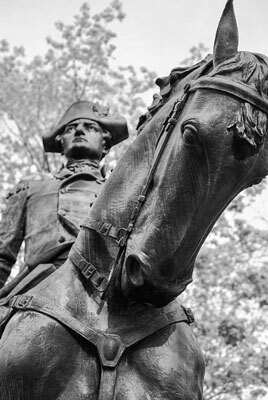 The camera’s spot metering mode was entered and metered on the statue of General Anthony Wayne. This told the camera that he and his horse should be exposed correctly, regardless of the bright sky beyond.